Yesterday AM, I arrived at Pond One only to find that my solar boat, Yaught, had come untied during a thunderstorm and drifted off to an inaccessible corner of the pond. I had my inflatable kayak handy so I paddled out to it to retrieve the boat. I tried to climb from the “I knew this would never work” kayak up onto Yaught and “See, what’d I tell ya” fell in up to my neck in green duckweed. “Woman drowns in duckweed pond” flashed through my mind as I sank a tentative sandaled foot down, down, down into silt at the bottom of the pond. Luckily I was hanging on to Yaught for dear life. At least the water was warm. I developed an awkward push/kick the mud style that slowly propelled me and Yaught back to the pier. About half-way back, I suddenly realized I still had my brand-new LG Straight Talk phone in my back pocket. This was one warranty request that was going to need some explaining. I pulled it out, dripping with duckweed and tossed it onboard. Well, all I needed now was to get attacked by a killer snapping turtle and my day would be complete. I climbed unscathed up on the pier, tied off the boat, and retrieved my cell phone, I sluiced both it and myself off under a stream of warm rainwater that was draining from a portion of my new plastic sheeting roof, There’s another bright idea that is going to need tweaking. I took the battery out of the cell phone and shook out as much water as I could. I laid it in the dash of my truck and left it there until I went home a few hours later. The cell actually started up but with a short-circuiting light display so I quickly pulled the battery and let it finish drying out on a warm kitchen stove top for another couple of hours. It is now working again. I am in awe. 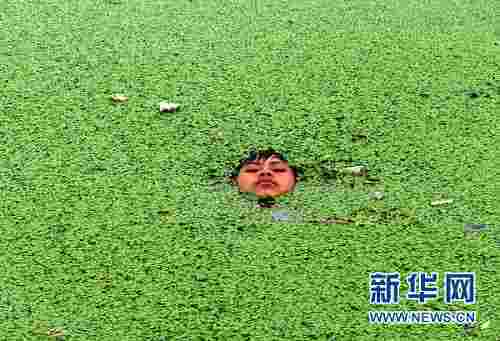 There is a famous picture of a Chinese little kid with just his face showing as he floats in a duckweed pond. Look at my prior post with several pics. Why does that sound so creepy? Sue, my KIDS don’t even know where these ponds are. I wouldn’t be found for weeks. However, on the bright side, they are only four and a half feet deep at the deepest, so I’d have to work hard at drowning in order to accomplish it.